National Bank Limited (NBL) and System Resources Limited (SRL) has signed an agreement regarding ‘Electricity Bill’ collection on Tuesday (June 6) at NBL’s Head Office. Choudhury Moshtaq Ahmed, Managing Director of National Bank Limited and Md. Zahidur Rahman, Chief Technical Officer, System Resources Limited have signed the agreement on behalf of their respective organisations. Additional Managing Directors of NBL Wasif Ali Khan and MA Wadud and Deputy Managing Directors ASM Bulbul, Abdus Sobhan Khan, Shah Syed Abdul Bari & Md. Farid Uddin Ahmed were present among others at this function. 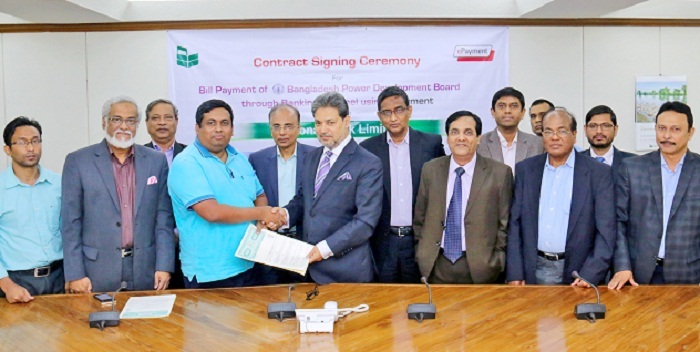 Under this contract the customers will be able to pay their bill through e-payment system of some selected Branches of NBL under Bangladesh Power Development Board and West Zone Power Distribution Company Limited.